A couple of debates sparked when anti-Marcos protesters faced off against supporters of the late dictator at Rizal Park on Friday. 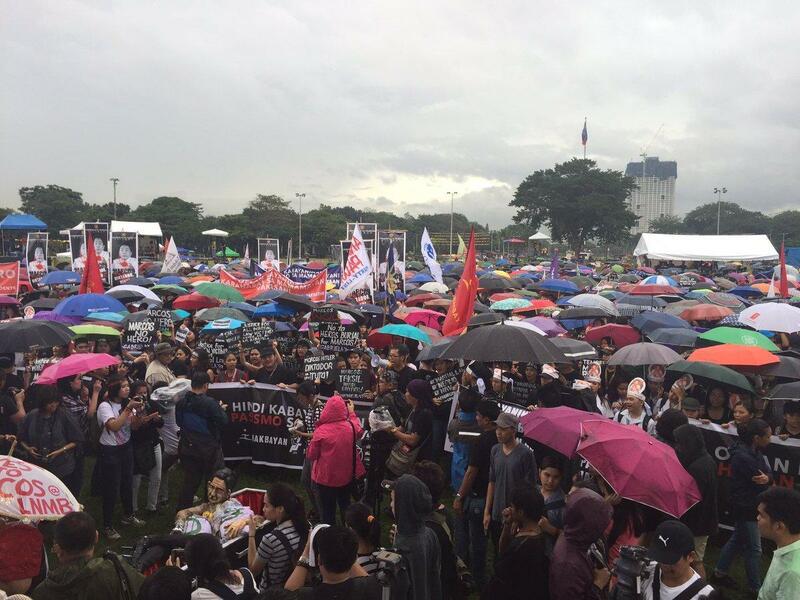 As groups protested the burial of late President Ferdinand Marcos at the Libingan ng mga Bayani near the Quirino Grandstand on Friday, a handful of people claiming to support President Rodrigo Duterte showed up at Luneta. While the two protests were deliberately separated by the police, some anti-Marcos protesters were compelled to cross the street to engage Marcos supporters in discourse. Two young men got into a debate over whether the declaration of Martial Law was justified. Ochi Tarzo, who came from the anti-Marcos rally, said that he didn’t intend to start a debate. He said he simply wanted to impart words that Marcos supporters can mull over. Mace, a supporter of both Marcos and Duterte, said that he never claimed that Marcos was a hero. He said that he was simply upholding the rule of law. The debate was relatively pleasant, both men shaking hands after the debate. Meanwhile, a law student who opposed the Marcos burial engaged three elderly men in a similar debate. However, the student, Kelby, cut the debate short because he felt they weren’t addressing the issue. One of the elder men said that he did not care for the historical revisionism that came as a consequence of the burial. Dozens of anti-Marcos rallyists also marched to Rizal Park, passing by the Duterte supporters.